Problem : We have to find key element in the sorted 2D array - which is sorted row and column wise. Brute force approach : Iterate 2D array and find whether that element is present or not. It's obvious but not a satisfactory solution. Complexity will be O(n^2) .So we can think of something in order of O(logn) or O(n). we can have several method using binary search or via zig-zag movement of matrix. logic behind this is that we will start from top right corner of matrix and will reach to bottom left , so we have three possible option to move on either left , bottom or diagonally. 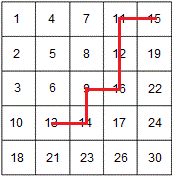 But given matrix is sorted in row and column wise ,so we will drop the idea of moving diagonally here. Now we can move either in left or bottom which will be decided by comparing key and matrix elements. return true; // key==matrix(row, column) so return true. return false; //control reach here means key not found. When we run this program we find that key is found there and it returns true.